What is magnetism? Why don’t we understand it? Is it just me? So what do we know? For most of us, it is one of those bits of physics that we met as fun early in school and life. By GCSE we get to a point where it is a property of iron and some other transition metals (top row, iron and two to the right, nickel and cobalt). Chemistry doesn’t discuss this as a periodic table function (but it should, shouldn’t it?). 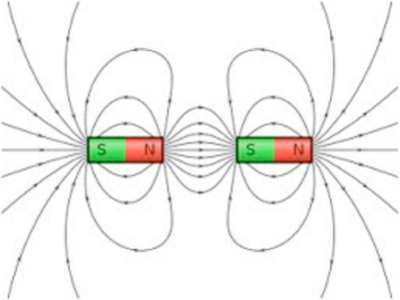 At AS/A2 level we learn that magnetism has something to do with opposite spin on electrons and that it occurs when some electrons are not paired; that somehow doesn’t except (conflict with) the Pauli exclusion principle, but it requires loads of electrons to decide to be the same way inclined. This applies to ferromagnets and to paramagnets¹. Both of these have unpaired electrons, that is to say there is an electron shell² with only one electron in it. Pauli says that paired electrons must have opposing spin. When in a magnetic field, the unpaired electrons can align with the field, which will reinforce it. That makes sense of an electromagnet; a coil of wire with current running through it has a magnetic field created; this field is multiplied manyfold (by magnitudes³ 1-3) by putting a ‘soft’ iron core inside the coil. Soft in this case is used to describe that it does this thing, in a circular definition⁴. We rapidly get to a point where the property can only be explained in terms of quantum mechanics, before which most of us long gave up trying to understand. When any material is put in a magnetic field, the electrons are affected by the magnetic field. This Lorentz force (it’s just a name) will push towards or away from the nucleus depending on orbit direction. This effect makes a change in the ‘bulk magnetic moment’, depending on the number of unpaired electrons. The paired electrons will have balancing Lorentz forces. This effect — the electrons are affected by the magnetic field — is called diamagnetism. Ferromagnetism occurs when the material has unpaired electrons; not only do the magnetic moments align to the applied field, they are also parallel to each other so as to maintain the lowest energy state. What I cannot find is why this happens; to put that another way, what there is special about the ferromagnetic substances that makes them have that property. For example, it is not sufficient to have unpaired electrons (paramagnetism). Ferromagnets and ferrimagnets are confusable: the ferro suffix applies when every magnetic ion contributes to the magnetism. For the ferri suffix, some of the ions are aligned the opposite way. Some strange materials end up with zero magnetisation, and are called antiferromagnets. As heat is applied so there comes a point at which magnetism (alignment of ions) does not occur. This is called the Curie temperature. Recently (since 1966) strong permanent magnets have been made from rare-earth metals⁵. As the f-shell is filled, it is possible to have as many as seven unpaired electrons spinning the same way. The theory says that the electrons in other orbitals have too much overlap with their neighbours to keep their magnetic moment. This localisation effect within the f-shell, with the anisotropy⁶, makes for high magnetic field strength, and therefore powerful magnets. Notable is neodymium alloyed with iron and boron into Nd₂Fe14B, or NIB, as a good combination of cost and strength. The downsides are (i) that the Curie temperature is quite low (310-400ºK), so that the low end of this range is body temperature and (ii) corrosion occurs, which damages the surface, so they need to be protected with some surface coating, perhaps plating or a resin. NIB magnets became competitively priced — and so preferred choices over the few alternatives — in the 1990s. You will find NIB magnets in hard drives, small generators and dynamos; you will also find them in linear motors, electrodynamic bearings and (hence, perhaps) in roller-coasters, maglev trains and a range of (relatively expensive) toys. Researching something else entirely⁷ I discovered the Curie point, or curie temperature (after Pierre Curie), the (high) temperature at which permanent magnetic properties are lost, leaving only induced magnetism. One can also use this temperature to demarcate the transition between ferroelectricity and paraelectricity (wiki says). Why would you care? The transition property was used for write/rewrite of data, notably on the (now defunct?) Sony minidisc. You care more because this property leads to significant understanding of how magnetism works, explains properties of materials and adds understanding to what it is that a liquid is not. Edits 20141111. Issues with index size being far too small. Shells are named K,L,M.... The Noble gases have full shells, but not all shells full: the atomic number of the noble gases are [He 2, Ne 10, Ar 18, ....Rn 86]. Neon’s 10 = 2+8, Argon’s 18 = 2+8+8; Krypton’s 36=2+8+18+8; Xenon’s 54=2+8+18+18+8; Radon’s 86=2+8+18+32+18+8; Ununactium’s predicted 118=2+8+18+32+32+18. 3 a magnitude of 3 is a multiplier of 10³. 4 Favourite quote from the Devil’s Dictionary: Recursion: see recursion. 5 A rare earth is not all that rare. They are the lanthanides (listed below the main grid in the periodic table); their Curie temperatures are below room temperature but compounds with other ferromagnetic elements (notably iron, cobalt and nickel) have Curie temperatures above room temperature and so become useful. The term that describes magnetising a crystal within the compound into a particular direction is called magnetic anisotropy⁶. Neodymium is as common as cobalt, nickel and copper; its ores are called monazite and bastnaesite, usually colouring the ground pink; it is mostly mined in China [also found in US, Russia, Brazil, India, SriLanka and Australia, even though Bastnäs [bastnaesite] is in Sweden]. It oxidises steadily in air; it forms a hydroxide easily with hot water; it reacts vigorously with the halogens. You fins it used to colour glass reddish-purple but fluorescent effects make that change with the lighting available. Americans are looking for other sources of Nd; I’d guess the Chinese are pushing the price up [2011 saw the price hit $500/kg before falling back to $300/kg] ND have 36 isotopes of which 5 are (not radioisotopes, so) stable, mostly 142Nd. Decay is from Pr - Nd - Pm. In China Nd₃+ is used as fertiliser, perhaps because of similarity to Ca₂+. 6 anisotropy means (i) having a physical property that has a different value when measured in different directions. A simple example is wood, which is stronger along the grain than across it. (ii) varying in magnitude according to the direction of measurement. 7 I was hunting to see what papers my father, HI (Ian) Scoins, had produced, as a small part of writing a eulogy for his funeral. See Dementia. In collaboration with Professor Stanley Rushbrooke, some twenty years older than Ian, the two produced a paper (and several others produced similar work at much the same time, though their’s is quoted a lot, possibly the most, which may say as much about the writing than the content) in 1955 (with others earlier) explaining in part how liquids relate to solids. Stan was a frequent visitor to our house when I was small. Rushbrooke held posts in both physics and chemistry departments at Bristol, Dundee, Leeds and Oxford. But it was during his time as Professor of Theoretical Physics at Newcastle University that his most innovative work was done. In his study of 1951 to 1953 Rushbrooke, helped by one of his students H I Scoins, made a decisive break with pre-war tradition by the reintroduction into statistical mechanics of the concept of the direct correlation function - a function that had been devised in 1914 by two Dutch physicists and then ignored for forty years. This function was to prove the key in creating a genuine continuum theory of liquids, free from the artificial constraint of a solid-like lattice. In 1954 Rushbrooke was elected to the fellowship of the Royal Society of Edinburgh and in 1979 to that of the Royal Society of London.